By Jim McNulty | Comments Off on Morgan Freeman, Morgan Freeman! I remember my first film shoot in L.A., driving around in my rental convertible, seeing the Hollywood sign and thinking about how many choices and decisions had gotten me to the point in life where I was being afforded the chance to do something as cool as producing a promo shoot on a Hollywood sound stage. It’s easy to get jaded in this business, but even after 20+ years in TV, I have to admit: We get to do some pretty amazing stuff in this job! I got to interview Morgan-Frickin-Freeman! I mean, even the introductions were amazing. Hearing Morgan Freeman say, “Mr. McNulty” is something I will NEVER forget. And no, I didn’t ask him to record my voicemail, although I’ve had several dozen people ask if I did! He was charming, he was engaging, he was everything you’d hope an A-Lister like himself would be. Guess I can check that one off the old bucket list! And you can check out the spots I wrote and produced from the interviews here. 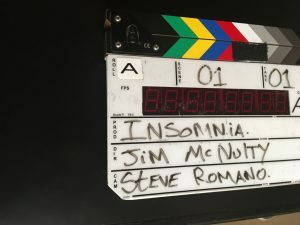 Major thanks to Andrea Allen at Insomnia and Lisa McKenna and Patrick Slevin at Science. In the past, I’ve interviewed primarily reality TV personalities who weren’t quite used to being on set, especially if we were launching their new show. Often, it would take more coaxing to get good soundbites out of them. But, getting to work with a seasoned professional like Mr. Freeman was a real treat. He even messed with us a little bit, which honestly put us all a little more at ease. So at this point in my career, I’ve interviewed Morgan Freeman and was a guest on Oprah. Not bad for a kid from outside Philly!